Keeping your furnace running smoothly is a top priority, and there is no better way to do that than with professional Arlington furnace maintenance services from Millie’s Heating & Air Conditioning. We can work on all types of furnaces, and whether your furnace is brand new or has not been serviced in years, it will benefit from the attention of our professional technicians. There are several reasons to keep up with regular professional maintenance on your furnace. Even the newest furnaces lose a small percentage of their energy efficiency each year. That small amount might not be noticeable from one year to the next, but as time goes by, it can add up to a significant increase in your heating costs. Regular professional maintenance can recoup almost all of this lost efficiency, though, which will help keep your heating costs down from year to year. This type of attention also gives our technicians a chance to uncover any problems as they are developing and replace worn out parts before they can really cause trouble. This keeps emergency repairs to a minimum and will also help your furnace to last longer by reducing the strain placed on it on a regular basis. When one part of the furnace is not working properly, the other parts often have to work harder to make up for that deficiency. So while you might not notice a change in the performance of your furnace, damage is being done. Regular maintenance can stop this type of thing from happening and results in an extension of your furnace’s lifespan as well as fewer repairs. No matter how long it has been since it was serviced, our professional Ashburn furnace maintenance services will benefit your furnace. On one of these visits, our technicians make use of the best available technology and diagnostic tools to check all of the parts of your heating system. They also clean out any sediment or debris that has built up in any part of your furnace, and they will change out or clean air filters as necessary. We can work on all types of furnaces whether we put them in or not, and we use only the highest quality parts and materials in all of our work. 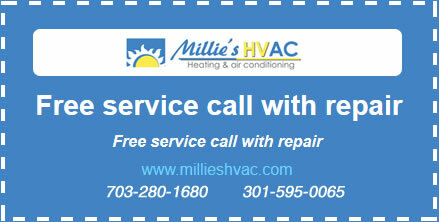 So if you need someone to take over maintenance on your furnace in the Great Falls area, be sure to give Millie’s a call today.